WASHINGTON (Jan. 29, 2008) — U.S. forces, having helped their Iraqi counterparts for more than a month prepare for the country's Jan. 31 provincial elections, are now stepping back, confident their planning and practice has paid off. "At this point, we're trying to enable, not to direct, the Iraqis in how to accomplish their mission," U.S. Army Capt. Nicholas Doerr, of 1st Armored Division's Task Force 4th Battalion, 27th Field Artillery Regiment, said. In support of the U.S.-Iraqi status-of-forces agreement that took effect Jan. 1, U.S. Soldiers rehearsed election security plans with Iraqi security forces on Jan. 25 at Combat Outpost Meade, southeast of Baghdad, in an area once known for sectarian violence. In the past year there has been a significant decrease in attacks on Iraqi civilians as the "Sons of Iraq" civilian security group, the Iraqi army and the reconciliation program have greatly increased security and helped to reinstate a sense of normalcy. For the rehearsal, Iraqi soldiers conducted a mock election drill on a large sand table. The unit acted out friendly and enemy actions, and the soldiers rehearsed their actions. While acting out the security plan, the Iraqi soldiers talked through their mission, critical tasks, actions and decisions to their leaders. "The complexity of the display may seem a little elaborate, but it's all just a tool we're providing to our allies to aid them in securing their own democratic future," Doerr said. Everyone was clear on their election-day role: Iraqi security forces will be overseeing election security, and U.S. soldiers will help if they are needed. "We are asking the coalition forces for air support, especially in [medical evacuations], should we need them," Iraqi army Col. Abdalah Ramadan Atia said. "However, the coalition will have very little involvement in this operation. We have experience from the 2005 elections. The units are trained and prepared." The combined forces got a trial run at the election when Iraqi security forces, detainees, hospital patients and other special-needs cases were allowed to vote three days before the general population. About 3,000 detainees in coalition custody voted yesterday at eight polling stations in U.S. Theater Internment Facilities. Multi-National Force - Iraq worked with the Iraqi government, the Independent High Electoral Commission, which the coalition established in 2004 to oversee Iraqi elections, and other agencies to provide credible and legitimate special-needs voting. A similar process was followed for detainees to vote in the 2005 elections. The Iraqi government provided the poll workers, ballots and administrative support, and Multinational Force Iraq organized the IHEC-authorized detainees for the safe and orderly election. In addition, dozens of international and other IHEC-approved observers monitored the voting process. Balloting opened at 7 a.m. and continued until all eligible detainees passed through the polling stations. Iraqi correctional officers and linguists who work with the detainees said they were honored to be part of the historic event and felt the elections are another sign that Iraq is moving forward as a democratic nation. Iraqi police also voted yesterday, at the Bilal Al Habashi School in Istaqlal Qada of northeast Baghdad. "This is a good step for Iraq and the people. They have free opinions to vote wherever they want and for any person they want to give peace in Iraq," Iraqi police Col. Majeed Khalil said. The special round of voting was set aside to ensure that soldiers will be able to provide security for the general election. "We have all the emergency stuff we need, and we are going to do our best to provide security to the people so that the people are able to vote free," Khalil said. For those who voted early, the importance of that decision was not forgotten. "It is very good," said Bakr Hdait, a hospital janitor from Adhamiyah, who was casting his vote. "We have to choose the person who is going to work for us. He's going to make a lot of things good for us." Iraqi security forces and U.S. soldiers also conducted a combined operation Jan. 25 to inspect and secure polling sites for the upcoming provincial elections in the Mahmudiyah Qada. The combined operation involved soldiers and military working dogs from the Iraqi army and U.S. Soldiers from the 1st Armored Division's 1st Combined Arms Battalion, 63rd Armor Regiment, 2nd Brigade Combat Team. The soldiers inspected and secured polling sites at four schools in the Warij region, which will be used as voting centers. Ensuring the sites are safe is a responsibility of the Iraqi police, who will be posted at the polling sites on election day. "There will be 15 [Iraqi] soldiers and 10 [Iraqi police officers] at each polling site. 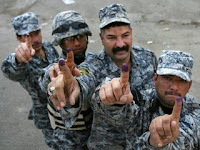 I am using all my resources to make this a good election," Iraqi army Maj. Jabbar Hafuth, a battalion commander, said. Throughout the pre-election security sweeps, Multinational Division Baghdad military police dogs searched for possible explosives at each polling site. "The [Iraqi army] is gaining good knowledge working with [Multi-National Division - Baghdad] soldiers during security patrols on tactics, techniques and procedures," Army Staff Sgt. Roderick Buck, who serves with Company C, 1st Combined Arms Battalion, 63rd Armored Regiment, said. Iraqi soldiers also are working with Iraqi police and the Sons of Iraq to establish vehicle checkpoints on roads and highways in the Mahmudiyah area. "I am happy to protect my country and school. I want to help all the kids and hold free elections. I want leaders to help Iraq and the new government," Abaas Kathum Abdulah, an Iraqi soldier, said. Iraqi police guard polling stations during the time between the special elections conducted on Jan. 28 until the general elections scheduled for Jan. 31. Iraqi security forces are in the lead for providing security at polling stations for voters during the Iraqi provincial elections. Iraq in lockdown on eve of vote. Newsweek: The Iraq match-ups to watch. Taylor trial witness: Rebels cut off my hands. Zimbabwe opposition to join government. At least 25 dead after Nairobi blaze. Caterpillar plague spreads in Liberia. Thousands of Tamils protest in Toronto. Thieves shoot foreigner near Mexico airport. U.S.-Mexico border fence almost complete. HAHAHAHA, My arse. U.S. dealers arming Mexican drug cartels. Arrest them! N. Korea scraps all accords with South. New commander heads to Gitmo. Judge refuses to delay Gitmo detainee's trial. Sept. 11 a factor in Fla. terror retrial. Cross-posted @ Rosemary's News and Ideas. Digg! "The Citizens of America, placed in the most enviable condition, as the sole Lords and Proprietors of a vast Tract of Continent, comprehending all the various soils and climates of the World, and abounding with all the necessaries and conveniencies of life, are now by the late satisfactory pacification, acknowledged to be possessed of absolute freedom and Independency; They are, from this period, to be considered as the Actors on a most conspicuous Theatre, which seems to be peculiarly designated by Providence for the display of human greatness and felicity; Here, they are not only surrounded with every thing which can contribute to the completion of private and domestic enjoyment, but Heaven has crowned all its other blessings, by giving a fairer opportunity for political happiness, than any other Nation has ever been favored with. Nothing can illustrate these observations more forcibly, than a recollection of the happy conjuncture of times and circumstances, under which our Republic assumed its rank among the Nations." Source: PatriotPost.us - Subscribe here. To get started, ACLU: Supermax Too Good For Gitmo Detainees is from the Stop the ACLU. I received some news from Michael Yon on the 18th of January about some of the work our guys are doing in Afghanistan. WOW! Rollin' In Hash. On the 27th, he also sent a message that he was in Israel for a conference and to do some more reporting. Jerusalem. Would you believe the Lithuanians gave Michael an award for his reporting in Afghanistan?! Too bad our own government does not recognize his talents. Please read this. It is very important, as all Michael's posts are. BTW, Michael won this year's Milblog award. M. Zuhdi Jasser is the President of the American Islamic Forum for Democracy based in Phoenix, Arizona. He is a former U.S. Navy Lieutenant Commander, a community activist, and a physician in private practice. He has written his 'This is the speech Obama should deliver to the Muslims world", written over at The Investigative Project on Terrorism. The title of the article is, "President Obama's Message to the Muslim World: Walk the walk and then we'll talk the talk", by M. Zuhdi Jasser, For IPT News, January 23, 2009. I've written about him in the past. He is a Muslim who is tired of the press following these terrorists around by the nose. Give his writing a try and see what you think. This is an audio made by Barb and Jenna Bush for Sasha and Malia Obama. The title is "Bush Daughters Offer Counsel To Obama Girls." Hat tip: Big Dog's Weblog. Big Dog also provided me with this YouTube video on a blog titled, "The American Form of Government." This is the URL for the video: The American Form of Government. It lasts 10:35 minutes, but it is worth the time. Hamas Uses Schools and Ceasefire to Shoot Rockets at Israel. تنتهك حماس الإسلام و القرآن الكريم IDF VLOG: Hamas Profanes Islam . Israel Defense Forces Vlog: Hamas is a Terrorist Army, Lt. Barak Raz. "Determine never to be idle. No person will have occasion to complain of the want of time, who never loses any. It is wonderful how much may be done, if we are always doing. And that you may be always doing good, my dear, is the ardent prayer of yours affectionately." Today is a wonderful day that will be ignored by those in the media who do not care about our men and women in the Armed Forces and the people we have liberated, but the news is available if you only seek outside of the United States! There are a few places within the states that are carrying this story, but they pay the AP for the copy right. Amazingly, they all say the same thing! That's real journalism? LOL. I admit, after reading these articles, I do not believe I could write a better article than Taipei Times has written. So without further adeiu, here is their article with a little interruption for an image and a quote from ABC News. Early voting begins in Iraq elections. Iraqi policemen hold up their ink-stained fingers after casting their vote in the country's provincial elections in Baghdad, Iraq, Wednesday, Jan. 28, 2009. The polls opened Wednesday for members of the Iraqi security forces, detainees and hospital patients. General voting is scheduled on Saturday. (Hadi Mizban/AP Photo), courtesy of ABC News. Soldiers, police, prisoners and displaced people began early voting yesterday ahead of Saturday’s provincial election in Iraq, which will determine the political landscape across the country as US forces withdraw. Iraqis held in detention were also expected to take part in the early voting. US and Iraqi authorities hoped the election would open the political process to more groups and further erode support for extremist networks. In the Shiiite south, Iraqi Prime Minister Nouri al-Maliki is hoping to win support in provinces long dominated by large rival parties. In other parts of the country, Sunni Arabs, many of whom boycotted the last provincial poll, are seeking a bigger share of provincial power. The early round of special voting was called to ensure that soldiers and police can all be on duty for a massive security operation during the main election on Saturday, when vehicles will be banned from the streets. “This is our challenge to every terrorist and to everyone opposed,” soldier Abed Khalaf said at a polling station in the northern city of Kirkuk, where the main poll has been delayed indefinitely but troops from other parts of Iraq can vote. “We came here today and we are not afraid, because an honest person should not hide his head from these groups,” he said. In other parts of Iraq there were some signs of confusion. At the Maqal Prison in the city of Basra, fights broke out between guards and reporters brought inside to film the voting. Several photographers were beaten by guards who accused them of taking pictures that showed prisoners’ faces. Tens of thousands of displaced people were also registered for early voting, although they make up only a fraction of up to 4 million Iraqis believed to have fled abroad or to other parts of Iraq during years of fighting. Holding a successful election is an important test of the ability of Iraqi troops to keep the peace as 140,000 US troops begin to leave. US President Barack Obama wants to speed up the pace of withdrawal after his predecessor George W. Bush promised to pull out the troops by the end of 2011. Iraqis have embraced the voting enthusiastically. Some 14,400 candidates, including nearly 4,000 women, have registered to fight 440 provincial council seats. Campaign posters are plastered all over the concrete blast walls that have sprung up throughout the country since the US-led invasion in 2003. The election campaign so far has not seen a surge in violence feared by US and Iraqi commanders. At least two candidates were assassinated, but overall attacks have remained at among the lowest levels since the war began. Please feel free to share your best posts with my readers on a daily basis. Just remember to add my permalink to the bottom of your post, then trackpost to me. Thank you. You don't have trackbacks available? Why not use Wizbang Stand Alone Trackback? Everyone have a nice day. 1. Rosemary's News and Ideas: This Is A Day Of Victory! Elections Begin. 2. Right Voices: Why Is Rahm Emanuel Holding Secret Briefings With CNN’s James Carville and Paul Begala, ABC's George Stephanopoulos. 3. Blog @ MoreWhat.com: Secretary of State Clinton Sets Up Chinagate II. 4. Conservative Cat: Rod Blagojevich and the Insane Defense. 5. Wingless: Alastair Crooke on Gaza & Hamas - living in the twilight zone! 6. Adam's Blog: You Paid For It. 7. Blog @ MoreWhat.com: Is Muntazer al-Zaidi Waiting for Other Shoe to Drop? 8. Astrologers: Astrology, Medicine and Astronomy. 9. Faultline USA: A Bill to End All Activities Beyond Breathing in Motor Vehicles. 10. Conservative Cat: Economics and the God Complex. 11. The Virtuous Republic: Fiscal Stabilization Act of 2009 HR 1, Part Two. 12. The Pink Flamiingo: How Stupidly Marxist Can Democrats Be? Cross-posted @ Talon, TCU Nation and Rosemary's News and Ideas. Trackback URI. Digg! "We have duties, for the discharge of which we are accountable to our Creator and benefactor, which no human power can cancel. What those duties are, is determinable by right reason, which may be, and is called, a well informed conscience." Many times I hear how much we as Americans have changed, and I would like to challenge this notion with a few facts. First of all, does anyone remember September 11, 2001? New York City was transformed that day, but its citizens were not. Many people think of us as a rude, uncaring, cold people. I protest this notion! On that day, you saw who we truly are. We are people, just like any other, who care about our neighbors whether we know them or not. Hard to believe? You have not lived amongst us then. There is also the massive hurricane Katrina. Was it the county, state, or federal government who was first on the spot, or was it volunteers and first responders who saved some of the people you never hear about because the media only wanted to focus on what could hurt President Bush? It was us volunteers. Even before these incidences, does anyone remember the San Francisco earthquake? There was an outpouring of love throughout the United States. People sent money, food, they showed up, and more. Does anyone remember the earthquake in Iran? I believe it was in the year 2002 or 2003. (I know there was another in the same place the next year, but I am referring to the first one.) Even though we despise their government, we do not despise their people. There was an outpouring of aid from the citizens of this country (besides the government). Yes, when a neighbor is in need, we are there to assist without question or hesitation or a requirement to be paid back (in most cases). That is who we are. That is who we were. That is who we shall always be. "[T]he opinion which gives to the judges the right to decide what laws are constitutional and what not, not only for themselves, in their, own sphere of action, but for the Legislature and Executive also in their spheres, would make the Judiciary a despotic branch." Read this again. It says so much in just one sentence. Remember what it says. That is what we've been saying! WASHINGTON (Jan. 26, 2009) – As U.S. forces become more engaged with the enemy in Afghanistan, there may well be a rise in American casualties, Vice President Joe Biden said Sunday. In an interview on CBS' "Face the Nation," Biden described the security conditions in Afghanistan, Pakistan and Iraq -- a trio of countries he recently visited -- and President Barack Obama's decision to close the U.S. detention center in Guantanamo Bay, Cuba. He said Afghanistan has deteriorated due to a failure to provide sufficient economic, political and military resources, as well as a lack of coherent policy among allies involved there. The Taliban are in "effective control" of significant parts of the country, he added. "The bottom line here is we've inherited a real mess," he said. "We're about to go in and try to essentially reclaim territory that's been effectively lost." Biden said more troops are necessary in Afghanistan, where an estimated 25,000 additional U.S. forces are expected to deploy over the next 12 to 18 months, according to defense officials. Some 34,000 U.S. servicemembers currently are there. "It's going to require … some additional military forces. There are going to be additional efforts to train their police and to train their Afghan army," he said. "And all of that means we're going to be engaging the enemy more." Describing other factors in Afghanistan, the vice president said corruption is rife among the ranks of Afghan National Police, and that the country is the source of 95 percent of the world's opium and heroin. Asked if intensified engagement would lead to more American casualties, Biden said, "I hate to say it, but yes, I think there will be an up-tick." "As the commander in Afghanistan said, 'We will get this done, but we're going to be engaging the enemy much more,'" Biden said, quoting Army Gen. David D. McKiernan, commander of NATO's International Security Assistance Force and U.S. forces in Afghanistan. Biden met with McKiernan earlier this month during a Middle East fact-finding mission that brought the then-vice president-elect to Afghanistan, Pakistan and Iraq. "We're in the process of working with the Pakistanis to help train up their counterinsurgency capability, their military, and we're getting new agreements with them about how to deal with cross-border movements of these folks," he said. "So we're making progress." He underscored that the president has pledged he would not hesitate to use action against high-level al-Qaida personnel in the area. Using a football metaphor to describe the situation in Iraq, Biden said the United States is on the 20-yard line, which in football terms is 80 percent of the way to the goal. "But now comes the really hard part. The surge did work. Our military has done everything we've asked of them, but there needs to be a political reconciliation in Iraq," he said, pointing to the three elections slated for 2009 as key indicators. He also emphasized the need for laws determining how oil revenues and political power will be distributed. Biden hailed the status-of-forces agreement that took effect Jan. 1 and will guide the security relationship between Washington and Baghdad as a “strong sign” of Iraqi political movement. "There's progress being made on it," he said of reconciliation among Iraq's ethnic groups, "but we need a much stronger push, and there has to be an additional show of responsibility on the part of the Iraqi leaders that they're able to govern." Biden also discussed Obama’s order to close the Guantanamo Bay detention center in Cuba within a year. He said shuttering the facility presents difficult decisions, including where to relocate detainees, but that closure will be achieved within the 12-month timeline. The vice president said detainees will not be released within the United States because, aside from one detainee, they are not American nationals, and therefore have no legal status in America. "They're either going to be moved and tried in American courts or they're going to be sent back to their countries of origin," Biden said. "If they are not a U.S. citizen or if they are not here legally, then even if they were released by a federal judge, they would not be able to stay here in the United States." Biden acknowledged that some countries have indicated they do not want to repatriate detainees. White House Counsel Greg Craig is reviewing detainees on a case-by-case basis, he said, adding that other countries have agreed to allow prison facilities for holding enemy combatants captured on the battlefield. "What I anticipate happening is that those people who are in a situation where it is either the evidence is in question or it's going to be hard to make a case, we will most likely be rendering them back to their countries of origin or another country," he said. The vice president said the new Obama administration is still determining what it has inherited in the detention facility. "The one thing we do know is that the maintenance of Guantanamo, its symbol and the consequences of this symbolism around the world, it has grown terrorist organizations, not diminished terrorist organizations," he said. Lance Cpl. Pete Reed provides security during a patrol in support of Operation Gateway III Dec. 28, 2008, in Farah province, Islamic Republic of Afghanistan. Operation Gateway III was a strategically planned effort to clear Route 515 of improvised explosive devices and provide and maintain security along the important east-west roadway. Reed is an automatic rifleman with Company I, 3rd Battalion, 8th Marine Regiment (Reinforced), the ground combat element of Special Purpose Marine Air Ground Task Force – Afghanistan. Angel has this wonderful video I am going to share with you (hat tip, Woman Honor Thyself), and it hits us squarely in the face. Listen first, then we'll talk. So do you still believe that we, as Americans, are immune from this? Oh, do not be so trusting of our government! That is your first mistake. NEVER trust any government, even our own. Yes, even though it is the best one around. Are you aware that 3000+ mosques have been built here by Saudi Arabia since September 11, 2001? Yes, and they are teaching hatred of the United States gov't and Americans. Funny thing is, they are taking jobs in a gov't they are taught to hate. How safe do you feel about that? Please forgive me. I guess it would help if you knew what I am so upset about, eh? The Netherlands gov't has charged Geert Wilders, a Dutch lawmaker who made a film linking the koran to violence (well, duh! ), with the awful crime of offend muslims. Huh? Since when did offending someone become a criminal offense? Since you allow your government to make laws against people who are nationals in the favor of people who moved to your country and demanded you follow THEIR laws or they will burn your country up and start murdering everyone. Now would someone please explain to me how this works? You come to my country. You demand special treatment, treatment I don't even receive. Then you want me arrested for using my own GOD-given rights? THE STATE DOES NOT GIVE ME THESE RIGHTS, you idiots. God, Jesus Christ--NOT allah, does. We've fought you since our inception, and we shall fight you forever if you insist on continuing to make such demands. How dare you! If you can't stand the heat, move back to your tyrannical country. Good riddance. For the normal people (including Muslims), if you would like to help by supporting Geert, there is a petition below that you may sign. Thank you in advance for all the signatures. We must speak up for free speech everywhere, even in the Middle East. Maybe especially in the Middle East! The In Defense of Geert Wilders Petition to The Dutch Government was created by and written by Ragnar Danneskjold (larsmoisturefarm@hotmail.com). The petition is hosted here at www.PetitionOnline.com as a public service. There is no endorsement of this petition, express or implied, by Artifice, Inc. or our sponsors. For technical support please use our simple Petition Help form. Please feel free to share your best posts with my readers on a daily basis using Linkfest. Just remember to add my permalink to the bottom of your post, then trackpost to me. Thank you. You don't have trackbacks available? Why not use Wizbang Stand Alone Trackback? Everyone have a nice day. These are posts from some of my friends for your enjoyment, edification, education or just plain rants. Either way, you should find something you like. lol. Have a great day! 2. Conservative Cat: More Milla Jovovich Movies Will Help the Economy. 3. The World According To Carl: Uncle Jay Explains The News — January 26, 2009. 4. Blog @ MoreWhat.com: ABC’s ‘This Week’ Exposes Pelosi and Other Flaws. 5. Adam's Blog: Going for Broke. 6. Conservative Cat: A Minor Mistake by Our New President. 7. Wingless: MUST SEE: What Lead to Cast Lead. 8. Woman Honor Thyself: International Holocaust Remembrance Day. 9. TALON: No Free Speech For Geert Wilders. 10. Wingless: INSANITY! Israel agrees to ceasefire without Shalit!? 11. Wingless: Cuba: Beautiful Country, People…Not so Beautiful System. Cross-posted @ Talon, The Conservative Underground and Rosemary's News and Ideas. Trackback URI. Digg! "[J]udges, therefore, should be always men of learning and experience in the laws, of exemplary morals, great patience, calmness, coolness, and attention. Their minds should not be distracted with jarring interests; they should not be dependent upon any man, or body of men." WASHINGTON (Jan. 23, 2009) – As part of the Obama administration's assessment of the strategy being employed in Afghanistan, the U.S. military will focus its efforts on achieving shorter-term goals there, the Defense Department's top official said Thursday. "One of the points where I suspect both administrations come to the same conclusion, is that the goals we did have for Afghanistan are too broad and too far into the future," Defense Secretary Robert M. Gates told reporters at a Pentagon press conference. President Barack Obama met with Gates and other National Security Council members at the White House on Jan. 21. The United States needs to set "more concrete goals" for Afghanistan that "can be achieved realistically within three to five years," Gates said. For example, he said, efforts should be made to re-establish Afghan government control in the country's southern and eastern regions, as well boost security and improve the delivery of services to the population. And, U.S., coalition and Afghan military operations targeting al-Qaida and Taliban insurgents must be maintained in Afghanistan to prevent the re-establishment of terrorism in the region, Gates said. Obama said yesterday during a State Department visit that increased violence in Afghanistan and Pakistan threatens global security and constitutes "the central front in our enduring struggle against terrorism." The Afghan government, he said, has been hard-pressed to deliver basic services to its people. "Violence is up dramatically in Afghanistan," Obama said. “A deadly insurgency has taken deep root." And, along Afghanistan’s eastern border with Pakistan, he said, al-Qaida and Taliban fighters "strike from bases embedded in rugged tribal terrain along the Pakistani border." About 34,000 U.S. troops are posted in Afghanistan. 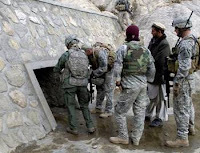 Commanders there have requested about 30,000 additional U.S. forces to be used to suppress resurgent Taliban fighters and al-Qaida terrorists. Meanwhile, Obama is studying several Pentagon-provided options for a drawdown of U.S. combat troops from Iraq. Improved security and reduced violence in Iraq today "clearly permit" a responsible drawdown of U.S. troops from Iraq, said Navy Adm. Mike Mullen, the chairman of the Joint Chiefs of Staff, who accompanied Gates at yesterday's news conference. The availability of more troops for Afghanistan, Mullen said, is generally "tied to that [Iraq] drawdown." The threat to the United States now “is focused in the Afghan theater,” Gates said, including "both sides" of the Afghan-Pakistani border. Obama, accordingly, "wants to put more emphasis on Afghanistan," the secretary said. Therefore, Gates said, the U.S. military is transitioning from the "highest priority that we have given to Iraq over the last several years, and moving that priority to Afghanistan." Marines patrol for insurgents in Afghanistan's Helmand province last month. Secretary of Defense Robert Gates has said the military in Afghanistan will focus on concrete, short-term goals. KABUL, Afghanistan (Jan. 21, 2009) – Members of the provincial reconstruction team in Afghanistan’s Nuristan province visited Zirat village this month to assess the effectiveness of completed projects and to develop ideas for future initiatives. Until February of last year, the main income for the villagers was earned by harvesting poppy. Since the eradication of poppy production, the villagers have turned to other methods to provide for their families. To assist in the effort, the PRT built a canal that feeds into the farmlands, allowing villagers to maximize farm production. “With the canal, they are able to spread the water and grow wheat in the winter and corn in the summer, as well as saplings, fruit trees and nut trees that we planted for them,” Army Master Sgt. Ryan Bodmer, PRT noncommissioned officer in charge, said. Some villagers expressed an interest in sources of income other than farming. Kathrin Lauer, representative for the U.S. Agency for International Development assigned to the PRT, met with a group of women seeking ideas for potential jobs. “What they told me was with the eradication of the poppy, they simply do not have enough money,” Lauer, a Washington Terrace, Utah, native, said. Lauer suggested the possibility of making money by learning an intricate Afghan embroidery technique used by women in Kabul and Jalalabad. “An Afghan American, living in New York and working in the fashion industry, saw that the embroidery the Afghan women do is so unique that it sells well in the United States,” Lauer said. Members of the provincial reconstruction team in Afghanistan’s Nuristan province inspect the condition of a canal used by villagers to irrigate their wheat and corn fields in Zirat, Afghanistan. Cross-posted @ TCU Nation, SGP and Rosemary's News and Ideas. Digg! Finally, have you noticed that some excellent military videos seem to disappear because they offended someone’s politically correct sensibilities? Where Military is Always the Top Category! It’s all about the troops. 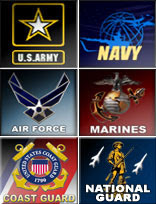 It has dozens of military categories, and we will add more when and as requested. If you have the videos on your PC, the uploading process is as simple as YouTube. If you don’t have the videos, you can add your favorites from YouTube, Google, and other video sharing sites by simply copying and pasting their embed code when you select the “Add a video from an external website” method on the add videos page. Best of all it is free for all to post. All it requires is a simple registration and your valid email address. There are plans for future advertising opportunities at Pro Troops Tube. However, at this time, Pro Troops Tube is offering free links for any posting more than 25 videos, free column banners (150 X 75) for those posting 50 or more videos, and full size (468 X 60) to the top three posters each month. Those qualifying for the column and/or full banner ads will need to supply their own banner art work which must be the exact prescribed sizes. Pro Troops Tube will accept jpg and gif banner image formats. Copy and paste the sidebar banner image code to add to your pro troop BLOG or website. Send us a link to your web page where it is displayed and we will add our site to our sponsors page. Also visit our PX powered by Amazon with all of the pertinent Military Categories to make your search for Military related books, dvds, guns, sports, and self-defense products easier to find. There will be additional military, veteran, patriotic and appropriately themed sponsors coming soon. Lastly, while I am personally affiliated with a number pro troop groups and efforts, Pro Troops Tube is a private enterprise. It is free to view and post for all of our pro troop community; however the computer memory, CPU, storage and bandwidth resources required to operate a video share system are considerable. In that light, we hope you will occasionally consider patronizing our sponsor sites which will help to defray our costs. All attempts will be made to keep our advertisers and sponsors relevant to our pro troop, military and veteran audience. Share the fun, share the videos, support the troops, let’s show YouTube how it’s done. Please drop a line by reply or leave a comment at the Site Comments page to let me know your thoughts and suggestions. Thanks. 1. Rosemary's News and Ideas: Pro-Troops Tube! 2. Right Voices: President Obama warned Republicans on Capitol Hill today that they need to quit listening to radio king Rush Limbaugh if they want to get along with Democrats and the new administration. 3. Walls of the City: it is for the children. 4. Beagle Scout: Google bomb backlash on The One. 5. Woman Honor Thyself: Support Geert Wilders: Free SpeecH only for Izlam? Cross-posted @ Talon and Rosemary's News and Ideas. Trackback URI. Digg! It's awfully hard to enjoy the other rights when the people have decided (by judicial fiat and constitutional ignorance) to allow the right to life be perverted by the public in their policies. These are not man (OR WOMAN) given rights, therefore governments nor people may vote them out of existence. WAKE UP! We have been committing genocide against our children for too long. How long will this go on? Until the people rise up and revolt against this injustice. Which side of this war will you be on? I came upon this article (I forget how), and it is quite interesting. The way things have been reported around here, you'd have thought this was the opposite of what the majority of people in the USA wanted. My oh my, what a web it is when at first the press decides to deceive! GUANTANAMO BAY US NAVAL BASE - Parents of five 9/11 victims called Monday for the US military prison at Guantanamo Bay to remain open and for the military commissions to try the five men accused of perpetrating the attacks. "We demand that this camp stay open and that the process continue," said Joe Holland, whose son was killed during the September 11, 2001 attacks on the World Trade Center in New York, and the Pentagon in Washington. "Right here, right now, this is a good process, they are getting a fair trial," Holland told reporters, referring to the military commissions established by the administration of President George W. Bush to try "war on terror" detainees held at the controversial facility. "Guantanamo has been described as a national embarrassment. Mass murder in America is embarrassing," said Donald Arias, his voice trembling with rage. "Mister Obama, it will be your job to take care of us." President-elect Barack Obama, who takes office on Tuesday, will likely make good on his campaign promise and shutter Guantanamo as well as Bush's military commissions by issuing an executive order shortly after taking power. Chosen by the Pentagon to witness the hearings, the five representatives of the 9/11 victims spoke after a day of pretrial hearings, where self-proclaimed 9/11 mastermind Khalid Sheikh Mohammed appeared alongside four alleged co-conspirators. "I believe the preponderance of 9/11 victims defend the death penalty," Arias said at the press conference. "This is not an issue for federal courts." It could take several months to fully close down the detention camp, as US officials will have to transfer some of the 248 prisoners to other countries and then decide whether to try the remaining suspects in US courts. Obama has acknowledged that closing the prison will take longer than many of his supporters had hoped. "We waited eight years, we had nothing ... This is an ongoing process," Jim Riches said about the military commissions, whose fate now hangs in the balance. Mandated by Congress in 2006, the military commissions were established by the Bush administration to try terror suspects under separate rules from regular civilian or military courts. The controversial system allows convictions based on classified and hearsay evidence, and critics say it allows for verdicts based on testimony obtained through torture and abuse. Of the 248 inmates still held at the US naval base at Guantanamo Bay, Cuba, only about 20 have been charged, including the five suspected 9/11 conspirators. EMBARASSING??? So you pukes are worried about being embarassed? I recommend you crawl right back underneath the rock you slithered forth from. Your presence is neither needed nor desired here. You, dear sirs, are traitors to this country, and the next attack shall surely carry its blood on your hands. You do not even have the brain to comprehend this. "Human rights! Human rights! ", you decry. Tell me, please, where were you when those people were jumping off the Twin Towers because they did not want to burn alive? Where were their human rights? Black, yellow, red and white, it did not matter. Just the fact that you exist is enough for them to want you dead, but you know better, right? You, sir, are a fool of the worst order. May the Good Lord forgive us for whatever happens to our country in the future because of your stupity. Yes, Dear God, Protect us. Sharing this with Political Byline: Why we can never withdraw from Afghanistan until the job is done, Woman Honor Thyself: Geert Wilders: Prosecuted for “Hate” by HaterS?Geert Wilders: Prosecuted for “Hate” by HaterS?, The World According To Carl: Open Trackback Friday — January 23, 2009, DragonLady's World: OTA Monday 120, The Pink Flamingo: Barack Obama's Very Bad First Week, Cao's Blog: Monday's Open Trackback Party!, Leaning Straight Up: The Economic Stimulus: White Guys Need Not Apply, Democrat=Socialist: DS Saturday Night Caption, Conservative Cat, and Right Voices: President Obama warns Republicans on Capitol Hill today that they need to quit listening to radio kink Rush Limbaugh if they want to get along with Democrats and the new administration, thanks to Linkfest Haven Deluxe. Cross-posted @ Rosemary's News and Ideas. Trackback URI. Digg! "[The President] is the dignified, but accountable magistrate of a free and great people. The tenure of his office, it is true, is not hereditary; nor is it for life: but still it is a tenure of the noblest kind: by being the man of the people, he is invested; by continuing to be the man of the people, his investiture will be voluntarily, and cheerfully, and honourably renewed." 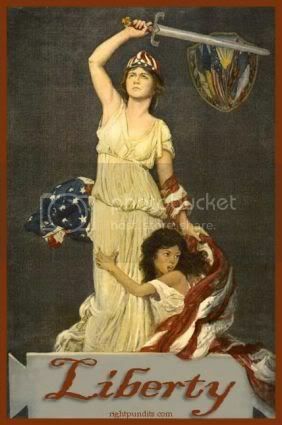 "There exists in the economy and course of nature, an indissoluble union between virtue and happiness; between duty and advantage; between the genuine maxims of an honest and magnanimous policy, and the solid rewards of public prosperity and felicity; since we ought to be no less persuaded that the propitious smiles of Heaven can never be expected on a nation that disregards the eternal rules of order and right, which Heaven itself has ordained." It's about time, and I'm grateful President Bush did it. Today President Bush commuted the sentences for Border Patrol Agents Ramos and Compean. They will leave prison March 20, 2009. They never should have been there in the first place, but I would like to thank everyone who kept up the good fight and did not quit the fight to free them. Thank you. Please read this statement below from The National Center For Public Policy Research press release. I believe it is very important and better written than I am able to at this time, so without further adieu, here it is. Black Leader Lauds Bush Commutation of Border Agents' Sentences. Washington, D.C. - Mychal Massie, the chairman of the Project 21 black leadership network, is praising the decision made today by outgoing President George W. Bush to commute the sentences of jailed Border Patrol agents Ignacio Ramos and Jose Compean. Under the terms of the commutation order, made by President Bush on his last full day in office, the imprisoned law enforcement officers will be released on March 20. Ramos and Compean were sentenced to 11 and 12 years, respectively. Much of their time since entering prison in January of 2007 has been spent in solitary confinement. "I sincerely want to thank President Bush for commuting the sentences of Ignacio Ramos and Jose Compean," said Project 21's Massie. "Their freedom has been too long in coming. We are pleased that, in one of his final acts as chief executive, President Bush has done the right thing and shown these men mercy." Ramos and Compean were prosecuted for an incident that occurred in February 2005 on the U.S.-Mexico border near El Paso, Texas. They chased Osvaldo Aldrete-Davila on foot after he abandoned a van containing 743 pounds of marijuana worth an estimated $1 million. During the chase, Ramos shot at Aldrete-Davila after Ramos thought he saw Aldrete-Davila draw a gun. Aldrete-Davila escaped across the U.S.-Mexico border, and Ramos assumed Aldrete-Davila was unhurt. In fact, Aldrete-Davila had been shot in the buttock. U.S. Attorney Johnny Sutton later charged Ramos and Compean for pursuing Aldrete-Davila without supervisor approval, moving spent shell casings and improperly reporting the fired shots. Aldrete-Davila was granted immunity to testify against Ramos and Compean. He recently plead guilty to charges that he conspired to smuggle marijuana into the United States twice after he was granted immunity and faces a jail term of between five and 40 years and $2 million in fines. Quoted by CNN.com, an unnamed Bush Administration official said: "The President has reviewed the circumstances of this case as a whole and the conditions of confinement and believes the sentences they received are too harsh and that they, and their families, have suffered enough for their crimes." Project 21's Massie added: "I have repeatedly told the President that their sentences were too harsh and that they did not fit the crime. I am pleased that he finally agreed." Massie also expressed thanks "to all those who stood with us in our petitions in favor of freeing these brave men." Project 21’s Massie was an outspoken national voice in seeking a pardon or commutation for Ramos and Compean. Massie wrote about the case in a commentary published in The Washington Times on December 28, 2007. This commentary is available at the Washington Times. "I Pray Heaven to Bestow The Best of Blessing on THIS HOUSE, and on ALL that shall hereafter Inhabit it. May none but Honest and Wise Men ever rule under This Roof!" I am praying as well, Former President Adams. From your penmanship to God's ears! There is a new site that has been created in order for all of us to have access this so-called economic recovery bill. The name of it is 'Read the Stimulus.org'. I am going to write down all the dollar amounts I can find so as to save you the trouble. Feel free, however, to read this yourself. They need several more people to help them manually read this 334 page behemoth bill! TITLE I - GENERAL PROVISIONS. A seven person board shall be set up by the president to oversee the money. Oivey. No dollar amount. $34 billion to transform the nation’s energy transmission, distribution, and production systems. $30 billion in transportation, of which $30 billion is for highway construction. $31 billion to modernize federal and other public infrastructure. $19 billion for clean water, flood control, and environmental restoration investments. $10 billion for transit and rail. $41 billion to local school districts through Title I ($13 billion), IDEA ($13 billion), a new School Modernization and Repair Program ($14 billion), and the Education Technology program ($1 billion). $79 billion: state fiscal relief, $39 billion to local school districts, $15 billion to states as bonus grants, and $25 billion to states for other high priority needs. $15.6 billion to increase the PELL grant by $500. $6 billion for higher education modernization. $2 billion in this bill, and $20 billion overall, for health information technology. $4.1 billion - preventative care & evaluate the most effective health care treatments. Oh my. It appears I do not have all the 334 pages. Grr. These are the titles of each massive government so-called stimulus package, except most of the money is government money for government money. If you can find a better way to find how much they are spending money our money, please go to Read The Stimulus. Thanks. Have a nice day. It is being reported by many news outlets that North Korea now has between 4 and 7 'weaponized' nuclear weapons. The IAEA is not allowed to inspect these areas, and they now believe they have a better chance of obtaining 'friendly' and 'normalized' relations with the USA because of Obama. For all of you people who voted for him, I would like to thank you so very freaking much. Did we not warn you of this? Oh, but your hatred for President Bush was so fierce that you lost your minds. You must have. We are at war, and you deny this fact. We cannot allow this puny punk to push around, lest others begin to think they can do the same. Oh, but you got what you, didn't ya. I hope it was worth it to you. I also hope that if there is a nuclear strike, the weapon is aimed at you. 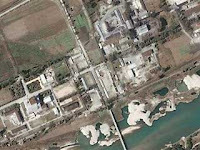 The links for some of these articles are: Researcher: North Korea has 'Weaponized' Plutonium (FoxNews.com), US Expert Says North Korea Has 'Weaponized' Plutonium (VOA), Researcher: North Korea has `weaponized' plutonium (AP, map included), North Korea Has Enough Plutonium for 6 Nuclear Bombs, NYT Says (Bloomberg.com: Asia), and NKorea says may retain nukes, raises border tensions with Seoul (SpaceWar.com). PS. SpaceWar.com is the ONLY one who spoke of the imminent threat to Seoul, Korea, whereas the South actually had to be put on high alert! I recommend this article, but only if you actually care about what is happening the world. My God. Did I go to sleep and wake up in the Twillight Zone? Somebody please, WAKE ME UP! These are some good people that I know really care, and they write pretty powerful articles as well. (Not that mine is powerful. The topic, yes, my writing, no.) That is why I would like to share their posts with you: Blog @ MoreWhat.com: Open Trackback Linkfest Haven Tuesday, third world county: Quick Tip, Political Byline: Former French President Gets Pounded By His Pooch, Walls of the City: sensor ping LV, The World According To Carl: Uncle Jay Explains The News — January 19, 2009, DragonLady's World: OTA Monday 119, The Pink Flamingo: Democratic Corruption Corruption!, Leaning Straight Up: With Obama President, People Finally Care and Hollywood Is Making a Pledge, Democrat=Socialist: Inauguration 2009 Food For Thought, and Conservative Cat: I'm Back, thanks to Linkfest Haven Deluxe. I have some new videos to share with you, so let's get started. U.S. Marines Jump from Osprey. 2:15. USAF JTACs teach Call for Fire to Embedded Training Teams in Afghanistan. 1:32. Night Strike on Hamas Terrorists 14 Jan. 2009. 4:29. IDF VLOG: Strikes Aborted to Protect Civilians - Lt. Barak Raz - 11 Jan. 2009. 1:48. Weapons Horde in Gazan Mosque 13 Jan. 2009. 1:31. Hamas Booby Trapped School and Zoo 11 Jan. 2009. 3:24. IDF Captures Hamas Intelligence Map - Lt. Barak Raz - 10 Jan. 2009. 1:51. Hamas Rockets During Cease-Fire and From Schoolyard 8 Jan. 09. 1:36. رسالة لأهل غزة من جيش الدفاع الإسرائيلي ٧,١,٢٠٠٩ . (There is English written so you can understand what he is saying.) 2:34. WASHINGTON (Jan. 16, 2009) - A new patrol in the U.S. Central Command is working to make it unprofitable to be a pirate, the commander of U.S. Navy Central Command and 5th Fleet said Jan. 15. Acts of piracy have "spiked" off the coast of Somalia with merchant vessels and crews being held for millions in ransom by pirates using AK-47 assault rifles, rocket-propelled grenades and ladders to take "low and slow" ships traversing one of the world's busiest sea lanes. The pirates come from a clan based on the northern coast of Somalia, Navy Vice Adm. William E. Gortney said, and they are in it for the money. "The problem of piracy started ashore," the admiral said during a Pentagon news conference. "It's because there is no rule of law. There isn't a government. There isn't economic stability. There isn't a court system that will hold these criminals responsible for their actions." Without a penalty for the Somalis, these clansmen -- who are normally fishermen -- took to piracy. "As commander of the Combined Maritime Forces, I directed the establishment of the Maritime Security Patrol Area," Gortney said. Coalition ships and aircraft patrol the area, but it is a complex operation, and task forces already in place had an existing counterterrorism mission. As a solution, Gortney established Combined Task Force 151 to conduct counter-piracy operations. Nations that are members of the task force "will bring their collective capabilities to bear to deter, to disrupt and eventually to bring to justice these maritime criminals," he said. The coalition group works with all concerned nations to deter the pirates and it has had some success. "I think, it's really a fascinating story to watch unfold as, at this point, 14 nations have sent their navies to work against this destabilizing activity," he said. This includes Russia and China, which are primarily escorting their own national flag vessels. "That allows us to go focus elsewhere with the rest of the ships that are down there," Gortney said. "When the activity spiked in the middle of August, we knew ... our current process wasn't working, and we had to take a new look at it," the admiral said. And it is working. In the last six weeks there have been only four successful piracy attacks, the admiral said. "Dis-incentivizing piracy" is what Gortney calls the missing piece. "The State Department is close on finalizing an agreement with one of the nations out there," he said. "And once we get that authority, then we're going to change my orders." The orders to the coalition now are to disrupt and deter, but not capture, pirates. "But once we get the authorities, my orders will change to disrupt, deter and capture, and try and hold them accountable for their actions," he said. "We have to make it unpleasant to be a pirate, and that's where, when we can capture them and try them and hold them accountable for their actions," he said. Cpl. Cole Daniels, a military policeman assigned to Combat Logistics Battalion 26, 26th Marine Expeditionary Unit, train with a shotgun aboard the amphibious transport dock ship USS San Antonio. San Antonio is the command ship for Combined Task Force 151. The task force conducts counter-piracy operations in and around the Gulf of Aden, Persian Sea, Indian Ocean and the Red Sea and was established to create a lawful maritime order and develop security in the maritime environment. To Libs: I Want A Divorce! I found this fantastic article while surfing the net, and I want to share it with my libertarian leaning, conservative, and liberal friends. It sounds like a very reasonable idea to me. See if you agree. We’ll keep our Judeo-Christian values. You are welcome to Islam, Scientology, Humanism, and Shirley McClain. You can also have the U.N. But we will no longer be paying the bill. We’ll keep the SUVs, pickup trucks, and oversized luxury cars. You can take every Subaru station wagon you can find. You can give everyone healthcare, if you can find any practicing doctors. We’ll continue to believe healthcare is a luxury and not a right. We’ll keep The Battle Hymn of the Republic and the National Anthem. I’m sure you’ll be happy to substitute Imagine, I’d Like to Teach the World to Sing, Kum Ba Ya, or We Are the World. We’ll practice trickle down economics, and you can give trickle up poverty your best shot. Since it often so offends you we’ll also keep our history, our name, and our flag. Would you agree to this? If so please pass it along to other like minded liberal and conservative patriots, and if you do not agree, just hit delete. In the spirit of friendly parting, I’ll bet you ANWAR which one of us will need whose help in 15 years. P.S. Also, please take Barbara Streisand. This is so awesome! Imagine having not to fight over whether or not a child is a life? Imagine being able to pray in school or teach your children at home? Imagine not having to believe in God and NOT being offended when others do? Imagine being able to keep what you earn instead of paying for the mistakes and stupid decisions of others when you were careful not to make those same mistakes? Imagine being proud of our country and not having to look over your shoulder to make sure there's not an anti-war protester idiot there. WOW! Finally. And they could live in their own utopia...until they figure out their way does not work. We must have in our new constitution an amendment that declares that anyone who comes on our property must have permission, must not be ill, must speak English (or be willing to learn it), and cannot receive ANYTHING that citizens are paying taxes for...PERIOD. That way there is no dispute with what to do with animals whose only desire it is to murder us. In this regard, every household should be required to own their own firepower. It used to be that way. Remember the minutemen? Imagine if they had to have a waiting period as the Red Coats were approaching? OMG! (lol) Ya'll have a great day! Hat tip: ZardozZ News & Satire. Here are some posts by friends over at the Linkfest for which I have shared this: The Pink Flamigo: Is New NASA Administrator Bad News For NASA?, Leaning Straight Up: Pigs Fly As I Agree With Ken Schram Over Seattle's Poop-Scoop, third world county: Mexico in Turmoil?, Democrat=Socialist: Nice Degign If You're Stalin, Woman Honor Thyself: Woman Honor Thyself, The Pink Flamingo: Stop The Conservative Republican Madness, and The World According To Carl: I'm Glad I Don't Live In Or Near Fargo, North Dakota, thanks to Linkfest Haven Deluxe. 2. Wingless: Why Would Israel Bomb a School? 3. Adam's Blog: Inaugural Double Standards. 4. Woman Honor Thyself: Cease-Fire in Israel? 5. third world county: "Look on my works ye mighty…". 6. The World According To Carl: Uncle Jay Explains The News — January 19, 2009. 7. Conservative Cat: I'm Back. 8. Woman Honor Thyself: Obama is not Martin Luther King…or GoD.